This Might Be The Scariest Trail In The World. But You’ll NEVER Guess Where It Leads. Unbelievable! 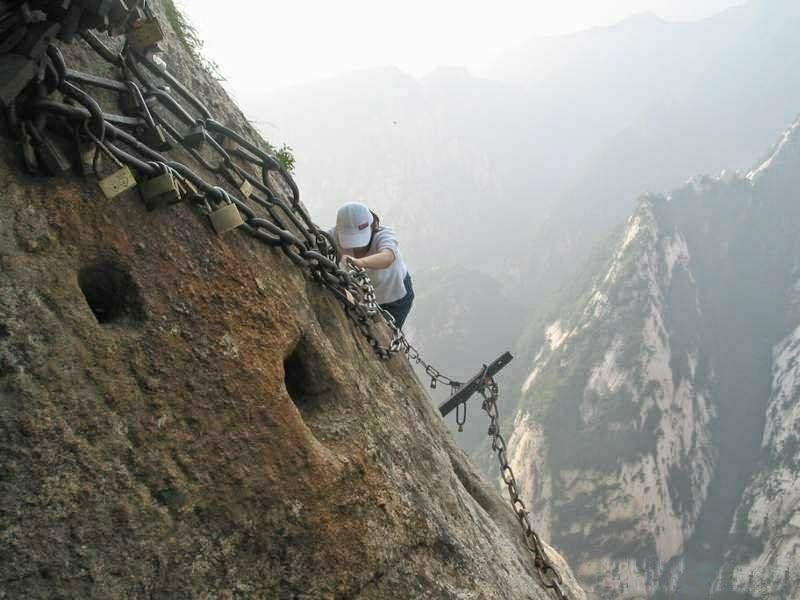 Home » china » earth » mountains » This Might Be The Scariest Trail In The World. But You’ll NEVER Guess Where It Leads. Unbelievable! A mountain in China holds some of the most captivating views you can imagine, with a very special location at its peak. The only problem is, you have to look death in the face to get there. 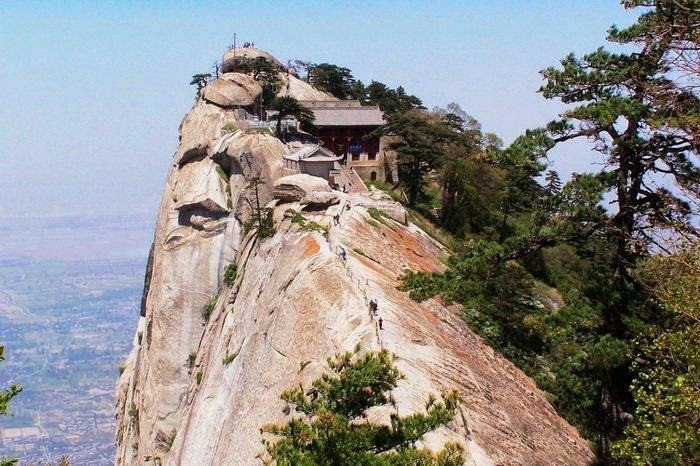 Located near the city of Huayin in the Shanzi province of China, is the majestic mountain, Hua Shan. 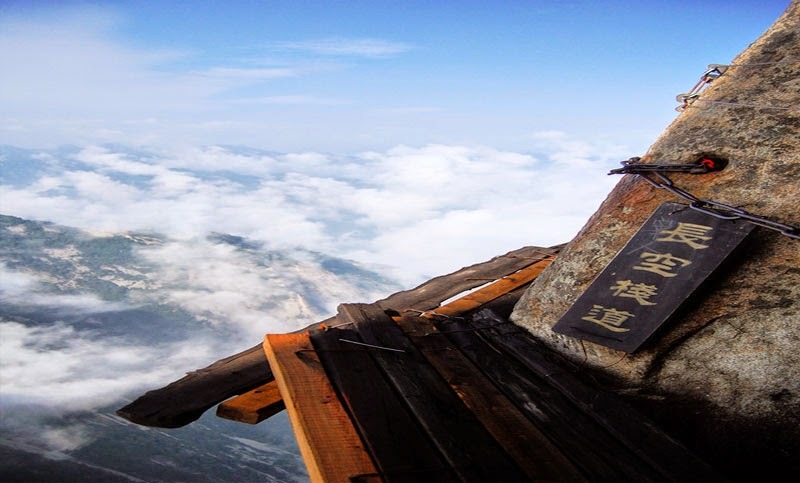 The name literally means “western great mountain” and is one of china’s 5 sacred mountains that have a long history of religious significance. Not only is Hua Shan both culturally important and simply breathtaking, but it also offers an amazing and beautiful hike to visitors – at least to those that are brave enough to make the terrifying trek. Let’s put it this way, you definitely cannot have a fear of heights. At the base lie the Heavenly Stairs that lead so far up the mountain that it’s near impossible to see where they end. 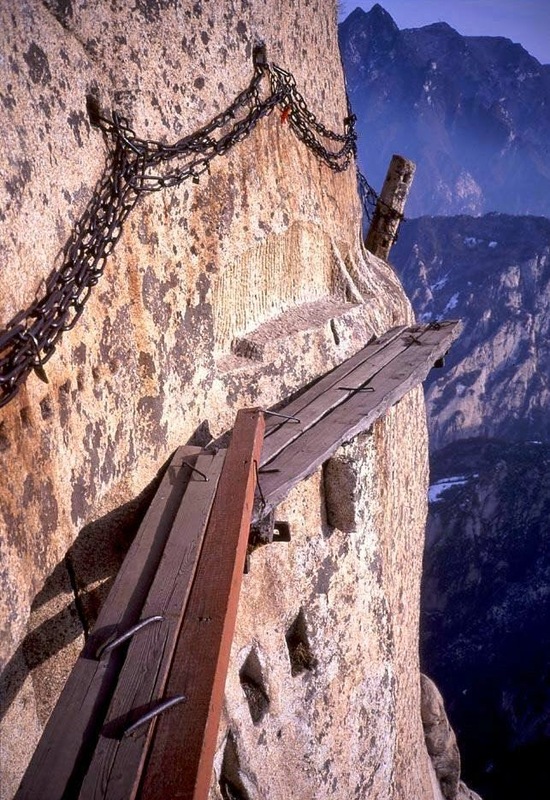 Of course, they stop ascending eventually and lead to one of the most dangerous trails in the entire world: the Hua Shan plank path. Unfortunately, the trail is true to its name and is literally composed of planks nailed into the mountain face; the only ground beneath you is a fatal drop away. Surprisingly, despite the life threatening danger, no one will force you into wearing safety gear, but it’s highly encouraged – I certainly wouldn’t recommend braving the journey without it! Yet, all this said, while the trail itself is amazing and the views are breath-taking, it’s what lies at the peak that causes so many to travel along this dangerous trail. But you’ll have to climb to the very top to find out what that is. The trek starts at the base of the mountain where the Heavenly Stairs ascend. While the stairs may be rather steep and rugged, this is the easy part so, if you have trouble at this point, you might want to head back. This portion of the trail is relatively safe and doesn’t require too much caution, although you definitely don’t want to slip! As you climb upwards you’ll also see small towns and villages below that emerged to support the temples and their peaks. 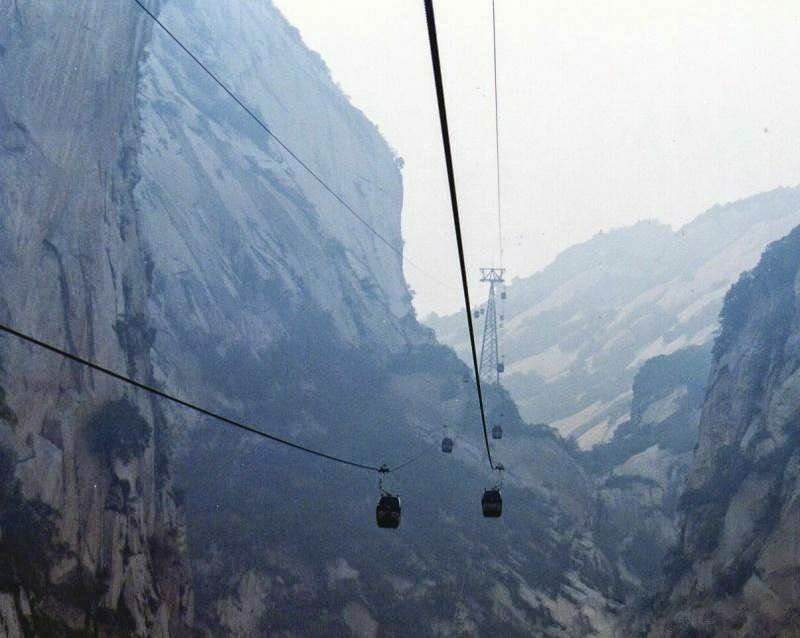 When you’re finally high enough, you’ll take a rickety gondola across to the southern peak. There’s a small portion of a regular path upon arrival, however, it soon becomes narrower and narrower until you’re forced to walk upon, yes, the dreaded plank path. The entire path is made up of wooden planks that have been strung together to bridge the gaps. The only thing you have to hold on to is a “railing” made up of chains and carabineers that are padlocked into metal stakes, hammered into the rock face. If you ever approach someone coming from the opposite direction, the only choice you have is to back up to the nearest landing and let them pass. There are flags to mark which path you’re on but make sure not to take the wrong one, as they’ll take you different locations (although, don’t worry, it’s usually just to a larger landing area). If you thought you were finished after the plank trail, think again. After winding around the mountain, you’re now forced to start climbing vertically straight up to the peak. There are chains to hold on to and toe holes that have been hammered out of the rock, but proceed with caution because you do not want to take a wrong step. But after the vertical climb you’re finally at the top and only have to follow one more long path before finishing – at least this one’s not made of planks. At the peak you’ll finally be able to reach the long awaited teahouse, the southern temple. Yes, people climb all the way up this mountain, risking their lives, for tea. Although it’s probably more so for the absolutely astonishing views that meet you when you arrive. The sights you can see from the top are amazingly breathtaking, and well worth the dangerous climb. The teahouse does hold some cultural significance as well, as it’s one of the 5 temples that are placed on each of the mountains separate peaks. All this aside, you probably won’t find a teahouse like this anywhere else, set on the peak of a sacred mountain 7087 feet in the air.